Intranquility Oil was used and that someone to suffer from troubled sleep, a restless mind, and wandering feet because of the work of the Intranquil Spirit. Inflammatory Confusion Oil was used and caused people to misunderstand one another so much that they quarrel and fight. What are the counteractive oils of these? Which oils can help me to be rid of these things? Uncrossing Oil or Jinx Killer Oil mixed with Clarity Oil will counter Inflammatory Confusion oil. To counter the evil work of the Intranquil Spirit, you should call upon a good spirit for help and protection: a loving ancestor, a beloved saint or hero, or God. Moses, King Solomon, Jesus the King, or Holy Trinity Oil may be of help. Additionally, if you feel someone has worked against you or a friend or family member with these products, a 13 day 13 herb cleansing bath and some strong protective work will prevent it coming back. This person had three usernames, which is a TOS violation, and posted under all three names (from two dfferent Yahoo accounts) about being cursed, wanting to uncrossing negativity and also seeking to understand the difference between uncrossing and attempting the reversal of a spiritual curse that had created a long-standing condition of afflicted livelihood and poor mental health. Later this person deleted all of its posts, renamed them "deleted" and was banned from the forum under all of its names and addresses for causing me a lot of board clean-up work. The questions remain generally of interest with respect to the excellent replies that were generated, so rather than delete the threads, i am posting this notice and reinstating the thread title. What you do next is according to what you have done up to this point. The 13 herb bath, taken for 13 days, is a great way to start an uncrossing or jinx removal ritual. Be sure to dilute the herb tea in water. It is very strong. Reversing is a spell to send back evil to the one who sent it to you. It is different from Uncrossing. It is a form of justified retaliation. Uncrossing refers to the undoing of "crossed conditions." The way someone gets stuck in crossed conditions is myriad. You can be crossed/cursed by a rival who knows how to work the roots, you can be in a lot of negativity, but also, and I think a lot of people forget this, you can simply be down on your luck. If you are in a slump, you can work with uncrossing products to get you out of the crossed conditions. Now, that clears that slate, now you want to work with something that brings conditions to you. The idea is that you just emptied your water bottle of filthy water, but you can't leave it empty. So uncross yourself, then depending on what you want work with use Blessing, Attraction, Crown of Success etc. While the vigil may be enough, I usually recommend a bath with the Vigil backing it up. Look into LMs 13 Herb Bath. Reversal work sends back your pain and suffering back to the originator. Make sure you really want to do that. If its already been a while, might as well move on and simply uncross yourself. For emotional ties, uncrossing is not what you seek, but rather Cut and Clear. Have you gotten a reading on this situation? Since it is a long-standing condition, you may want to consult with a worker so they can do a divination and see exactly what is the nature of what's going on. That way they can prescribe for you exactly what you'll need to do in order to completely break through from the condition. Cleansing - both of yourself and your whole home and maybe even your workplace, along with the Reversal work will most probably be on the game plan. However you might need Protection work, perhaps some Road Opening, and then some Drawing work to get things moving again. A reading will help you determine exactly what you need to do to start getting ahead. But the 13-Herb bath is a great way to start! You must be my twin! I'm beyond down on my luck, I'm suicidal - I can bearly handle the many bad experiences I've had these last couple of years, and like you, I'm convinced this was done to me by someone who was envious and didn't want me get to ahead and reach my goals. This person does practice the Dark Arts and is weird enough to think anybody who has something better than her is her enemy. I understand what it's like to feel crossed up and down on your luck for years on end - believe me. I finally did a cleaning on myself a few months back and I feel loads better. However, I also know what it feels like to be clinically depressed and talk of feeling suicidal and extremely depressed is not your simple "crossed up" kind of feelings. If your feelings are that extreme, it would be best if you first seek professional help from a doctor of medicine or psychiatry. Depression is a real medical illness and while I fully believe that magic can fix a lot of things, one must use common sense and do things in the real world to fix what's going on. What you need is a 13 herb bath X 13 days. I'm waiting for my 13-herb bath to arrive in the mail, but in the mean time i"ve been using eucalyptus, lenongrass, rue, agromany,and pine essential oil, along with reciting the 37 psalm, but nothing works; I was robbed and arrested in the span of two days last week, plus I'm behind on my rent and I've a $460 electricity bill. But I seriousy hope that 13-herb bath will help as well as seriously reciting psalms at appropriate times mentioned in the Secret of the Psalms book. Remember that first spells take time to manifest and second the 13 herb bath is aimed at Cleansing and Unjinxing. It doesn't address the issues that you seek directly. It wipes the slate clean, but something has to be added to the slate to help address the conditions. First, if you are behind on your rent you need to work with products to bring about work and money for you. Money Drawing products and Wealthy Way are great products to think about investing in. There are various threads on barebones methods of getting the same results. Look into herbs like Cinnamon, Allspice, Five-Finger Grass, and curios like Lodestones. If you've been robbed then think about protection. YOu can carry a protection mojo, work the FWP, or petition Saint Michael to keep you in his hands. Salt, Sage, Rue and Black Pepper can be used to create potent protection for yourself. Remember, that unless you are actually crossed (people get in situations like yours without magical causes) the 13 Herb bath is meant to simply help cleanse yourself. I know that you feel depressed, but people have come back from worse straights. Saint Jude can help in a desparate situation and consider contacting some friends to get the emotional support you need in such a stressful time. Good luck. I know that in some very severe cases to come out from the crossed conditions, the 13-Herb bath has to be repeated over intervals over a period of time. Like doing the 13-herb bath for the 13-days, then the next month doing it for 3 days, the next month 3 days, and on like that for a period of time revealed from divination. It may be that your case simply needs deeper work to get completely clean. And yes, you do also need to do restorative work such as drawing, etc, in order to bring what you want to you. I have a very touchy issue to discuss. One of my closest family members joined a religious organization which I won't name here as per the forum rules. Anyway, he'd always been a nice outgoing person that got along with everyone. Lately he's been acting very different, more secluded, expressing ideas that are quite terrifying, and alienating himself from the part of the family that doesn't share his beliefs. Of course he is free to practice whatever belief system he pleases. Him following a cult and hurting his family members if they don't comply, however, is not okay. What can I do to encourage to him break free from that and start thinking for himself again? If this one is against forum rules, please remove it and I apologize in advance. Thank you! Changing someone's religious convictions isn't something that is really feasible. However, you can work with Cast off Evil to help him overcome any undue influence that any peoples may be having on him. Coupled with sweetening work to help ensure a peaceful home. Peace Water and Peaceful Home products are definately helpful here. You might be able to sour his relationship with the cult. You could implement a moving candle spell to get him to distance himself from the cult. You can approach the situation, much like a spell-caster would to get a person to break-up in a relationship. In this case, your family member is in a relationship with the cult, so working with products that are intended to distance or break matters up might be helpful. I don't believe it's magickally impossible to get him away from this cult or to calm him down. You can work with products that remove negative influences, allow him to gain clarity, and be calmer and more peaceful toward his family. In my experience, people change their beliefs as life situations change (give and take) but all in all religious beliefs are quite embedded. I have friends whose beliefs I don't share but at the same time I do not discuss mine with them. Since you have these feelings try some of the suggestions and steer clear when necessary. Thats my take. Again, changing his religious *convictions* is not feasible. If he is part of a faith that you don't like get a reading to see if your case is justified in moving him away from such an organization. However, you would be within your full rights to ensure that he treats his family respectfully and that there is no undue influence on him. Stick with Cast off Evil and sweetening work. You can sprinkle Peace Water around the home, work a Peaceful Home honey jar with Blood Root. The Cast off Evil work may be complimented with Clarity work certainly. Thank you very much for the advice! I like the Cast off Evil and Clarity suggestion, as well as the Peaceful Home honey jar. I have heard so many good things about Peace Water lately, will order it ASAP! I have a LOT of negative energy, not just regarding my relationship, but EVERYTHING. It is especially affecting my relationship with the boyfriend. What work can I do to dispel this negative energy I have within myself and bring positive energy to the relationship and my life? 13 Herb Bath, Chinese Wash, and some Protection oil would be good products to start with. I would start with at least 3-7 days of baths with 13-Herb Bath since you feel you have a good deal to work through. Each day after you bathe, anoint yourself with the Protection oil on the soles of your feet, the base of your skull, and your solar plexus. After you complete the cleansing you may wish to do some Road Opening work to help bring in good fortune. But a reading will help you determine what is best in your case. Definitely get a reading to get more insight into the nature of this problem. 1. You need to wash the space, and if you and your boyfriend live together I would definitely do this. 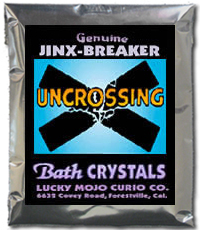 You can use Chinese wash, 13 herb wash, or you can use uncrossing bath crystals. OR you can get an uncrossing spell kit which comes with all of these products. Tere are several road opening spells that address different aspects of your life. 3. I would follow up with some fire of love work for your relationship along with some chuparrosa. My boyfriend is a very negative person with very low esteem. He always thinks of the worst outcome to every situation and it stops him from doing what he wants and needs to do. He wants to do the right thing yet doesn't have enough courage to do it. Our relationship is in the edge because of this. For instance, he says that he keeps thinking about the end of our relationship and what would go wrong to it. He admits to me that when he gets close to someone, he gets scared and backs off. I want to ask if there's anything that would remove his negativity, give him some courage to move forward and get a commitment from him? If your boyfriend would consider going to see a therapist/social worker/psychologist - a couple of sessions can go a long way in helping see one's self in a more positive and objective light overall. That said, I do understand that this may or may not be possible. You can also add the products (the bath crystals or the teas) to the laundry wash water, specifically the socks and underwear on a regular basis to ''reinforce'' the work. As to the commitment half of the equation, I'd consider waiting to give him time to strengthen up first, granted - that's just my own opinion. Consider using John the Conqueror and Crown of Success to help him connect with and begin to act with personal strength and conviction to follow up the Spiritual Baths. Blessings and best of luck to you both. Aura, thank you so much for your advice. I did went to a doctor about 2 months ago but he doesn't have any insurance anymore so he cannot continue seeing that doc though he's still taking the medication for depression though those medication don't really seem to work very well for him. As for LM products, is there a way I can do this for him secretly as he does not like or believe in hoodoo or any kind of magic? I am new here and wondered if you could help me. I fell foul of certain people (I think a coven who practice darkness) and now I feel that some negative spirits have attached themselves to my back as I feel drained. I cannot sleep and I think they are using their energy to attack me as I hear voices in my head and keep seeing people. As soon as I attempt to go to sleep they jolt me awake. What can I do to rid myself of this? I know who the perpetrators are. Also a Van Van to keep you protected - http://www.luckymojo.com/spell-van-van.html and a mojo bag or a talisman/amulet. I'm no expert in hoodoo at all, I go by personal experiences, lots of common sense, the lucky mojo website and catalogue and Hoodoo in Theory and Practice by catherine yronwode book. I agree with mistressalizes recommendation. Contact a reader at AIRR, they can help see what this is really about. If it is a spiritual attack or if it is something else. There are diseases that can give these types of symptoms as well. And I believe it is vital to have someone look at this before undertaking a lot of spellwork on your own. Try to keep an open mind to what your reader will tell you. Choose someone who you are good with healing and uncrossing work. I wish you the best of luck on your journey to a peaceful and blessed life. I agree with Ida also that there are some diseases that can give these symptoms. I also agree with keeping an open mind with what the Member of AIRR will tell you. Hey My name is Mary. I have a problem and was looking through your site and what i should do but i feel i am not educated enough to really grasp how i should handle my situation. Here is a little background detail. My husband and I went to a psychic here in Toronto. We thought she was real we thought she has goodness in her heart. After the first 2 month of knowing her things started to get worse and we kept coming back to her for advice. I started school in Sept of 2010, I was reviving osap check to survive. When we told her we were broke and had nothing but some side money we were making she advised us to get a big protection spell done that would cost us $7,500 dollars plus 200 CAD for candles until the work was complete. We went through it, broke our self till in fact we almost lost everything including each other. I am scared now that it has became worst with this women. I am not sure what i can do to stop her from doing work on us and everytime we light a candel it shows us more work this psychic is doing, trying to ruin our lives. The police can't do anything and I've called a member of my own religion in toronto but there is nothing they can do but make themselves aware of her. Can anyone please give some suggestions or advise us on where to get help? Below are some threads that give very good advice on what you have experienced. Devi Spring, who is a Forum Moderator has given some very good advice in several of these threads and she is in Canada. And AIRR, The Association of Independent Readers and Rootworkers is where you find skilled Professionals who are qualified many ways knowledge,gifts, and they adhere to a "Code of Ethics". A Member of AIRR can help you. You have been given excellent advice. In addition, u might want to consider keeping yourself protected from any negativity spilling over from him to u. Sometimes when we love someone and is attached to them emotionally, spiritually or naturally we can sometimes get caught in the crossfire of their negative thinking or actions. So make sure that u Shield yourself as you work to help ur sweetheart. Be Blessed! I need guidance in what incense products I should use to fumigate my house with. I recently started burning sage periodically but I want to take it up a notch and clear out any unwanted, uninvited "things" that the sage may not be powerful enough to get rid of. These incenses works according to their respective area of use. You may read about their alledged effect under each product mentioned. Try them all out and see which one suits you and your current situation at home in the best way. Praying over them before and during use may take it up yet another notch. Have a look at http://www.readersandrootworkers.org/wi ... _of_Psalms and see if you can find suitable words to accompany your fumigation. Thank you very much, Dr Johannes, I did read up about the effect of each product. I will use them all along with the suitable words from the book of Psalms for my fumigation. also consider working with the resin incenses offered by LM: http://www.luckymojo.com/mojocatincense.html#resin; just make sure you have a supply of charcoal to burn them on and a brazier or bowl lined with sand or salt to burn the charcoal in: http://www.luckymojo.com/incense.html#charcoal. Thank you, aura; I truly appreciate the help very much. Currently planning my next LM order (and waiting for the funds), and I'm wanting to know the difference between the Uncrossing, Jinx Killer, and Fear Not to Walk over Evil formulas. I read the pages, and it seems Fear Not is primarily for countering work done with foot tracking, while Uncrossing has to do with... well... uncrossing in general. Could someone give me a clearer idea what differentiates these formulas? I would say that Uncrossing will take care of any negative energy that is in your space, regardless of whether it originates from work done against you, negative thoughts by you or others, or spirits that may be hanging around. 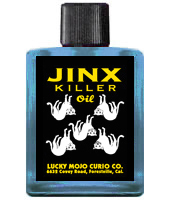 Jinx Killer is specifically to destroy curses directed at you. Jinx Killer is sprinkled on places where physical jinxing tricks have been laid, including foot tracks, oiled doorknobs, dusted papers, dosed foods. We use the oil, sachet powder, bath crystals (dissolved in water, or incense (to smoke a large area) as needed. Uncrossing is to remove crossed conditions. Most popular as a bathing supply but all forms are used, of course. 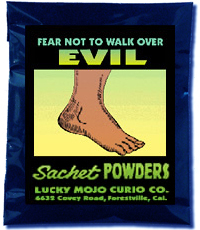 Fear Not To Walk Over Evil is specifically a protection against foot track magic. The Sachet Powder or Incense Powder are the most preferred for mixing in with local dirt and attain virtual invisibility; the oil or the powder may be used inside shoes as well as on the ground. Thanks! I have a better idea what product(s) I actually need to get now. Hello everyone! I had a reading done with Miss Bri and she mentioned that I need to have a banishing/uncrossing candle done for my negative thought processes that keep me from meeting the man of my dreams. I see that there is a banishing oil but not a banishing candle; there is, however, an uncrossing candle. Should I use that, or should I have a colored candle dressed specifically for this? If so, which color should I use? I plan on having LM light it at the church for me. You can order the Uncrossing candle and ask that they add Banishing oil to it when fixing it for you in the order notes. Or you can have them set an Uncrossing candle, and then order a Black vigil candle be dressed for Banishing. I have used both the Uncrossing Spell Kit and the Van Van Spell kit. I used the Uncrossing Kit a couple of months ago and the Van Van Spell Kit last month. But I haven't really seen any results yet from them. There was this guy that I had my eye on and he's acting even worse towards me now than he did before. Before, he didn't notice me, now he's trying to avoid me, although I haven't used any love spell kits on him yet. I wonder if I did something wrong? After I finished the Uncrossing Spell Kit, the directions said to dispose all of the ritual remains including the un-used material that was left over, and I thought that also included the Uncrossing oil that came with the kit, so I buried that along with the ritual remains. That's why I'm seriously considering having reversible work done. I'm starting to feel anxious and desperate. You could have kept the rest of the Uncrossing oil Hoodoogirl. When they say to dispose of ritual remains, it means the burnt candle ash, left-over wax, incense ash and papers/herbs left over from petitions. Unused product can be kept for use later on. Another thing to consider is that the reason professional rootworkers are around is because sometimes one is unable to to the work alone. You may not have the skills, you may just need a little coaching or you may well need someone to go in and do the job. Think of it like house cleaning. You can do the cleaning in the house by yourself, or you can do ''touch up'' tidying and leave the nitty gritty grease and grime to a cleaning lady. Your previous posts were merged into the longer thread on Reversing candles and I'm also beginning a thread specifically concerning this subject which may be of interest to other Forum members as well. It will also help the skilled workers who moderate to more accurately ascertain your situation and offer adapted council. Blessings and hope this helps. Thanks Aura. For a minute there, I thought I posted on the wrong thread, so I went and deleted it. Sorry about that. Another thing that I thought of that might have gone wrong, is maybe I inscribed my name on the candles in the wrong direction. Someone at the LM shop told me to carve my name going from base to wick on the candles when performing the uncrossing kit. Since then I have learned that when doing spells to repel things, you are supposed to go from wick to base. The same thing as when taking a bath, go down not up when repelling. I found that out from reading the LM forums. Although it might have had an influence, the directionality of your writing on the candle is only a small part of the spell and total equation, a reading would probably be the best course of action at this point. LOL, Ok, thanks for your help Aura. I just remembered something else, when I did the Uncrossing Spell a couple of months ago, I asked for the aid of both St Archangel Michael and the Spirit of my deceased mother. Maybe the two spirits clashed or canceled each other out. Just a thought, not really sure if that had anything to do with it. Maybe I should also do the 13 day spiritual cleansing for 13 days. I only used it that one day. It was included in the kit. But I will definitely get a reading as soon as I'm able to. You are just flailing about, imagining that the spirit of your late mother and the spirit of the Archangel Michael would somehow "cancel each other out." You need guidance in this work. Your guesses are not productive for yourself or for others reading this forum. 1) There is no universal agreement on the directionality of inscribing a name or applying oil to a candle. There may be a majority opinion, but there are so many variations that i encourage people to STUDY the subject and EXPERIMENT on their own to find a comfortable working system. For instance, you did not even mention the third-most-common candle inscribing and dressing variation, where you write both upwards and downwards from the mid-point, dressing up on one side and down on the other -- which is called "magnetizing" the candle. It's a very common method of work, popularized in the 1930s by the writer Louis de Claremont / Godfrey Spencer, the owner of the Oracle Products Co., and completely different than the other two methods which you just mentioned. Remember, this is not a role-playing game with a rule-set printed in a manual that accompanies your gaming pieces. This is folk-magic. 2) I cannot understand why you thought an Uncrossing Spell and Van Van Spell would attract a man. Maybe you did not make yourself fully clear in your post, but what i hear you saying is -- to me, a root doctor -- the equivalent of "I swept the floor but nobody has yet come over to my house to visit -- so sweeping the floor must have failed to attract visitors, probably because i did something wrong." But, actually, sweeping the floor does not attract visitors. It just makes the place clean when they do show up. If you want to attract visitors, you will have to send out party invitations or make friends and call them up and ask them over. And, with spell work, there are love-drawing spells that are the spiritual equivalent of inviting people to your home. 4) There are REASONS for this, many of them discernible by a professional reading from a root doctor. Trying to attract a man was only part of it. I also need help in other parts of my life as well and I thought both the Uncrossing and Van Van spell would improve my luck. The Uncrossing Spell was only my first time performing hoodoo and I guess it didn't get off to a really good start and you're right, I do need guidance with a reading, considering I'm very new at this. Okay, now *i* am thoroughly confused. You call yourself "hoodoogirl" but have never done this work before? Sorry, i'm not trying to make fun of you -- it's just that i am not at all used to newbies using names like that. Based on that usenername, and other posts, i thought you knew what you were doing! I'm gonna call myself SeattleSeaHawksQuarterback and post to a football forum and ask what a touchdown is. LOL! I think-- but I am not certain that these two are two different people. The IP address is different. This confused me. In one thread I am telling Hoodoogirl that we are a kind group despite asking her to watch her language, and trying to help her too, with spells to help her mom, who has a very bad relationship going on. She also has threads about her own ongoing love-work. That is the way I understood it. In another thread we have Hoodoogirl5 posting about Van Van and Uncrossing spells not working and her search for love. Her mom has passed and she is calling on her mom's spirit for assistance in her work, along with the Archangel Michael. Just thought I'd share, please correct me if I am wrong about this being one in the same (person). The only thing I know to do is to refer to the IP address. It does not violate to post from an office computer, a home laptop and a phone. Many of us have done that, but it does violate forum rules to have multiple user names. Any and all opinions and tech tips are appreciated! Tammie Lee -- I think you are right! We have two different people with almost identical names! I couldn't think of any other name to call myself. However, I just thought of a more suitable name and I'm going to change it. Did I have somebody else's name by mistake? Well I just changed my name to something more fitting. I hope this name isn't taken. Please let me know and I'll change it to something else. WHEW! Okay. Thanks. This is a whole lot simpler to understand now. Honestly, you had us going there for a while! No, hon, the problem was mine. I really thought you were both the same person. And kudos to Internet Detective Miss Tammie Lee.